Golden Currant This shrub is an ‘Idaho Preferred’ Plant. Golden Current is a native shrub that produces edible fruit. It blooms in the spring with clusters of fragrant golden yellow flowers followed by orange berries which ripen in the late summer. Hummingbirds, butterflies, and bees are attracted to the flowers when in bloom. It will grow in full sun or part shade to a height of 5' to 6' and a width of 4' to 5'. It is drought tolerant once it is established. The light green leaves turn red to burgundy in the fall. Use this plant as a hedge, shrub border, or naturalizing an area. Wildlife and birds are attracted to the fruit. Place bird netting over the shrub to protect the berries if you wish to harvest the berries. The berries make great jam. 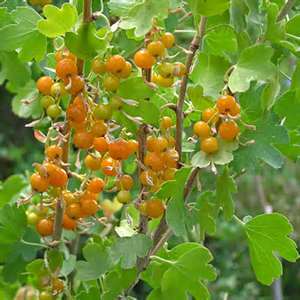 Golden Currant is a native plant for our area and it is also a Firewise plant.